If only there was a magic wand you could wave to make you more alert and better endowed in the brain cell department. Unfortunately you have to rely on hard work to get a decent result at the end of your course, but there are certain changes you can make to your diet that will give you a helping hand. Carbohydrates should make up a large part of your diet but this doesn't mean you can gorge yourself on take-out pizzas or pasta surprise every night. There are good and bad carbs and it's the good stuff that should be adorning your dinner plate. Good (or complex) carbohydrates are those that slowly release energy into the body so you don't have sudden peaks of energy followed by spells of lethargy when the voice of the lecturer is no more than a distant blur. The good news is that you don't have to drastically alter your diet in order to get enough good carbohydrates; you just have to adjust it slightly. Pasta is fine, but choose wholemeal varieties. 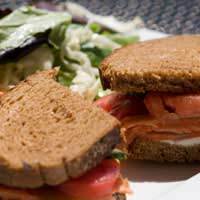 The same goes for rice and bread - wholemeal, or brown versions of these foods are less refined, and so, better for you. Many vegetables also provide a good supply of complex carbs and should be included in your diet. Carrots, parsnips and sweet potatoes are just some of the veggies that are good slow-releasers and will give your energy levels a continuous boost. They're also cheap and you can make up pots of vegetables stews or casseroles that can be kept in the fridge and will see you through a number of dinners. By now, everyone should be aware of the potential benefits of certain types of fish oils for the brain. Children are being given doses of omega-3 in ever more ingenious guises in the belief that this may help with their concentration levels in school. If you're not a fish fan you could take advantage of this and buy milk or other products that have the oils disguised in them. However, there's no substitute for the real thing and you don't have to familiarise yourself with filleting or removing heads in order to benefit from the nutritional goodies contained in fish. The best fish to eat for your weekly dose of omega-3 is oily fish such as salmon, mackerel or herring. Salmon is great in a pasta sauce or fish pie and if your lowly student budget won't stretch to fresh salmon fillets from the fishmonger then try canned salmon - a little goes a long way. Nuts are a great source of protein and make a healthy alternative to sweets and crisps, which will give you a short, sharp energy boost before making you crash again and crave more fatty foods. Walnuts, amongst others, contain omega-3 so if you're not so keen on fish, or you're a vegetarian, these should definitely be on your shopping list. In fact, most nuts and seeds (such as pumpkin and sunflower seeds) could have a positive impact on your brain power as many of them contain other essential nutrients. If you can manage to include some of these foods in your diet a couple of times a week you'll be giving yourself an extra boost. Look out for recipes and get creative. You don't have to do anything extravagant; a salmon and cucumber sandwich or a handful of sunflower seeds sprinkled over a salad will do the trick.